For over 30 years, Virhydro has designed and manufactured some inshore fishing gear. 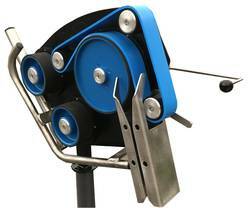 Its product quality has positionned Virhydro as a specialist in the inshore fishing industry. Virhydro offers a range of hydraulic equipments (pots haulers, nets haulers, longlines haulers, hydraulic power packs, fishing reels,...) and a selection of electric haulers. Our company sells its electric range under the brand HOOKLINE, and some of its longlines hauler under the brand Able Palangre.